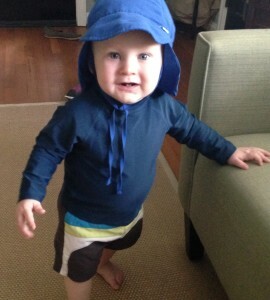 Our family loves being outdoors and here’s a picture of my son geared up for fun in the sun! With summer officially here it’s a great time to review the importance of sun protection. I’d like to share some practical tips for enjoying the outdoors without painful sunburns and potential for skin problems later in life. Lots of strong evidence has linked sun exposure to early skin aging (wrinkles!) and more dangerously, skin cancers. Epidemiologic studies have shown that 1 in 5 people will be diagnosed with skin cancer during their life. Children on average get 3 times more exposure to powerful and dangerous UV sun rays than adults. The most dangerous skin cancer is melanoma, which can grow very aggressively. Sunburns during childhood have been strongly liked to increased risk for melanoma! Luckily, there are several good ways to minimize sun exposure and prevent sunburn; the most important is simply sun avoidance. Avoid being out in the sun during the hottest hours, from 10 am until 4 PM. If a rating is not mentioned, lightweight clothing made with a tight weave is preferred. Holding the fabric up to compare how much light slips through is a good way to gauge this. For infants less than 6 months of age this is all we recommend, as skin younger than 6 months is generally considered casino online too sensitive for sunscreen. Keep babies out of direct sunlight; find shade under a tree or umbrella. When picking a sunscreen, there are a few important parameters to look for. All sunscreens include an SPF rating (sun protection factor). SPFs between 15-50 are recommended. Below 15 has not been shown to protect well enough and over 50 has not been shown to provide any extra benefit. Apply 15-30 minutes before going outside, even on cloudy days. Also important is to make sure the screen has UVA and UVB protection (the two kinds of most damaging rays from the sun), this is often labeled as broad spectrum. Recently a star system has been introduced. Sunscreens are rated from 1 to 4 stars, with 4 being the best. Water resistant sunscreen is good if you will be in the ocean or pool. All sunscreen should be reapplied at least every 2 hours to maintain effectiveness. Hopefully this will help you enjoy a sunburn free summer. Call us with any questions!